From Amazing Stories, August 1946. 'A SECRET METHOD FOR THE MASTERY OF LIFE ... Whence came the knowledge that built the Pyramids and the mighty Temples of the Pharaohs? ... From what concealed source came the wisdom that produced such characters as Amenhotep IV, Leonardo da Vinci, Isaac Newton and a host of others? ... Today it is known that they discovered and learned to interpret certain Secret Methods for the development of their inner power of mind ... This secret art of living has been preserved and handed down throughout the ages... The Rosicrucians (not a religious organization) will send you a Sealed Book of explanation ... Use this coupon for FREE copy of book ...' (Amenhotep IV, credited in the ad as "Founder of Egypt's Mystery Schools", is better known today as the Pharaoh Akhenaten). From the British edition of Astounding Science Fiction, December 1955. 'SECRETS ENTRUSTED TO A FEW ... There are some things that can not be generally told ... things you ought to know ... Behind the tales of the miracles and mysteries of the ancients, lie centuries of their secret probing into nature's laws ... 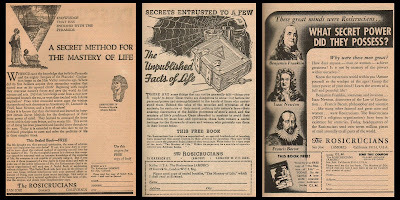 The Rosicrucians (not a religious organization), an age-old brotherhood of learning, have preserved this secret wisdom in their archives for centuries ... Write today for a free copy of the book "The Mastery of Life" ...' (Although very similar in wording to the American ads, this one has a London address instead of San Jose, CA!). From Galaxy magazine, July 1972. 'These great minds were Rosicrucians ... WHAT SECRET POWER DID THEY POSSESS? ... Know the mysterious world within you! Attune yourself to the wisdom of the ages! ... Benjamin Franklin, statesman and inventor ... Isaac Newton, discoverer of the law of gravitation ... Francis Bacon, philosopher and scientist ... were Rosicrucians ... 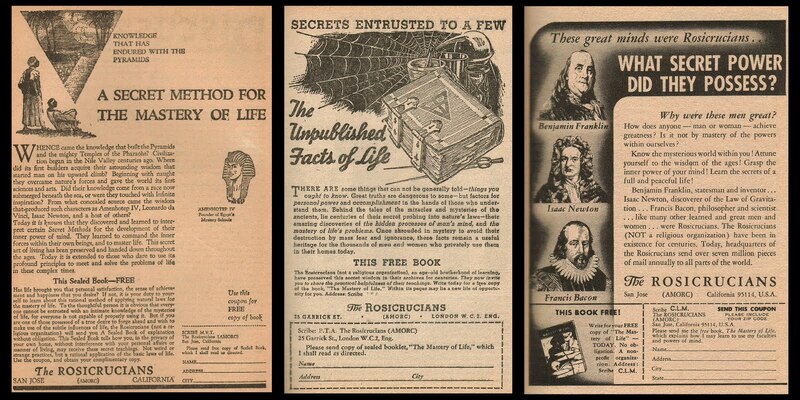 The Rosicrucians (NOT a religious organization) have been in existence for centuries ... Write for your FREE copy of "The Mastery of Life" ...' (This was the first Rosicrucian ad I ever saw, way back in 1972 when I had just graduated from comic books to "grown-up" magazines. I was totally intrigued by it, and I wanted to write off for the free book but -- as with the X-Ray Specs -- my mother said I couldn't. So I've had to remain unenlightened ever since!). Ha! My brother once got me on their mailing list to get back at me for a prank I played on him. They used to advertise in Fate magazine all the time. I recently saw a documentary that mentioned Sirhan Sirhan had developed an interest Rosicrucianism. Did you receive the free book of Secret Knowledge? What's in it? I can't remember. It was a bunch of stuff and it all pretty much went straight to the garbage. I just laughed because I instantly knew who was behind it and why.